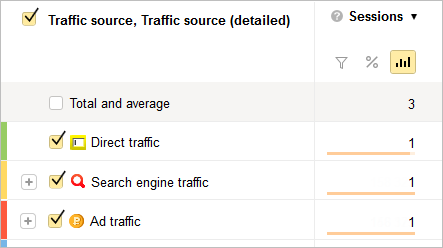 You can use attribution to build a report on traffic sources in different ways. When making a report, you can use information about three sources for each user: the first source, the last source, and the last non-direct source. For the “First click” and “Last non-direct click” models, Yandex.Metrica takes information from the user's session history. A user clicked through to the site from a content ad, viewed a few pages on the site, and left. The user returned to the site later, but this time from search results. Some time later, the user entered the site's address in the browser and completed an order on the site (this is the moment of conversion). As a result, the user had three separate sessions on the site. This model can be used for technical analysis of a site. For example, you can use internal referral analysis to detect pages that don't have the code snippet. This model is used for a site with deferred conversion — when the user takes a long time to make a decision about a purchase (or other goal) and may go back to the site from different traffic sources several times before taking action. You can also use this model if you need to know which of the sources attracts the most new users to the site. This model lets you calculate the conversion rate more precisely. All sources can be divided into significant (non-direct) and insignificant (direct or repeat) clicks. The sessions from direct sources (clicks on saved pages, entering the site address, or internal traffic) are attributed to a previous non-direct source, allowing you to better measure the performance of sources. 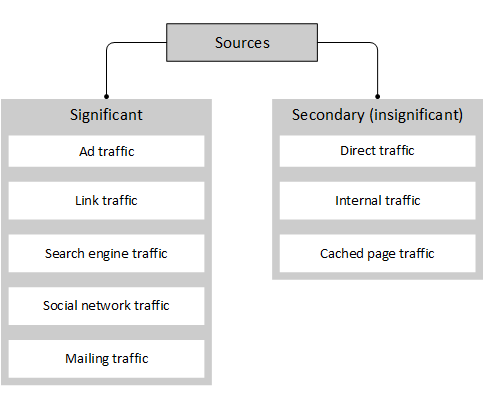 This attribution model also gives you reliable results for sites with fast conversion that occurs during a single session.